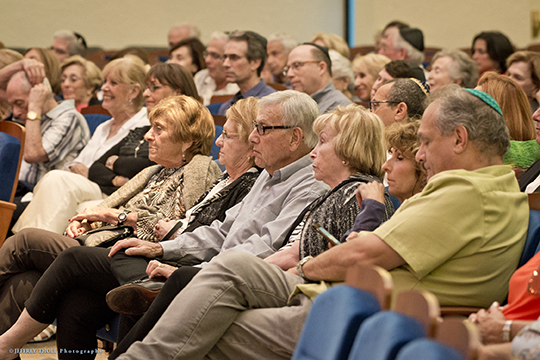 More than 250 people recently shared a unique opportunity to hear from two former White House Jewish Liaisons. Noam Neusner and Matt Nosanchuk who served, respectively, in the George W. Bush and Obama administrations, shared the stage on May 22, 2017 at B’nai Torah Congregation, in an evening program presented by the Jewish Community Relations Council (JCRC) of the Jewish Federation of South Palm Beach County. Rabbis David Steinhardt and David Englander of B’nai Torah provided the opening and closing thoughts. Matt Kutcher, JCRC Chair, introduced the evening’s moderator, Matthew C. Levin, the Federation President & CEO, who has known and worked with our guests for many years. All cited the wonderful example of the two speakers who, from very different perspectives, speak substantively with civility and respect. While Neusner and Nosanchuk may have represented very different administrations, they also found common ground on many issues facing American Jewish concerns.